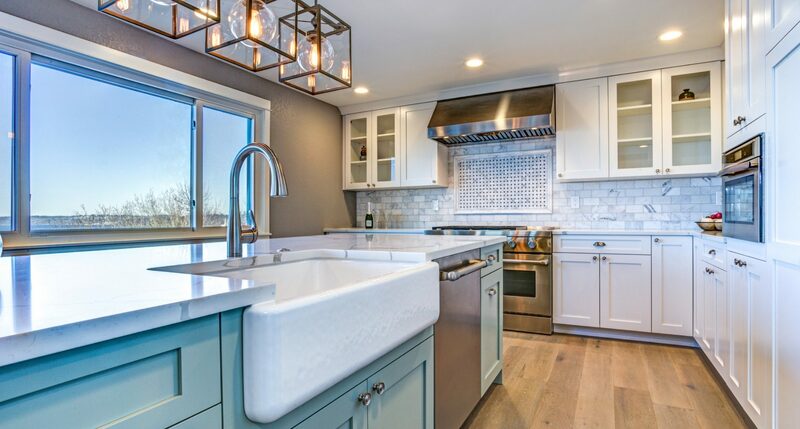 The colors you choose when making home improvements can be just as important as the fixtures and features you include, especially in the kitchen. Introducing blue into this area could make the difference between a relaxing yet lively kitchen that’s fun to cook and be in. The color blue is known universally for its calming properties, which is a quality that also unlocks creativity, a behavior that can go a long way in the kitchen. This color works just about anywhere in this busy room. Blue isn’t the most common color for flooring, although it is striking when used as a border on a light tile floor. Some natural stone flooring materials have blue as an incidental color. The right tile might make it possible to stay with the classic tan with a bit of blue. Sheet vinyl and ceramic materials also use blue as an accent color. This color isn’t used often on the ceiling, even though it’s the color of the sky on a clear day. A light blue will make a small kitchen feel larger and the opposite is true of darker hues. A light, icy blue might bring cooling relief on the hottest summer day, of which the New Braunfels area has its share in the summer. The beauty of using paint as home improvements tools is that if it doesn’t work out, you can quickly paint over it. Blue cabinets with contrasting wall colors can be impressive as long as the colors in the room are balanced with wall and floor colors. If you’d like to try the concept a bit at a time, start with a blue desk area or make the pantry doors blue. White cabinets with a touch of blue on the door pulls always look sharp. 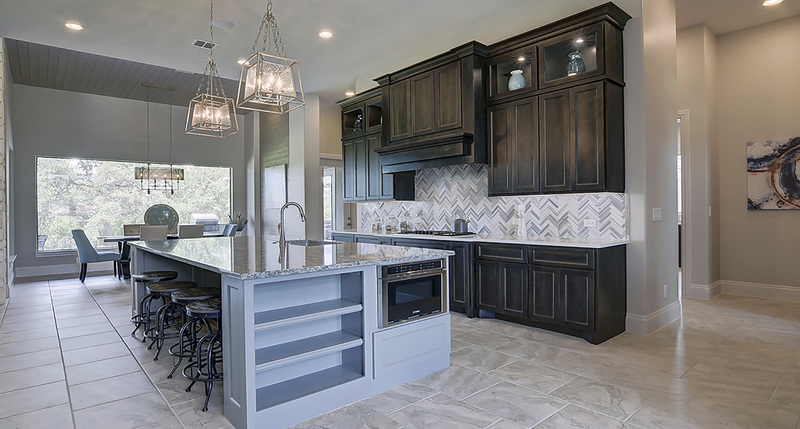 Natural materials used for countertops like granite and marble sometimes have blue streaks or spots that can tie into other places in the kitchen where you’re using blue. If you’re using laminate counters, it’s easy to find as a solid or accent color. If your design team for your home improvements includes a decorator, ask about using blue in the fabrics found in kitchens. Window coverings, table linens and kitchen towels can be wholly or partially blue. They might tie in with what you’ve specified for the hard kitchen surfaces, or introduce the color on its own. Although blue isn’t a common color for the dominant surfaces in the kitchen, there is no reason why it can’t be. It’s a soothing color that comes in hundreds of hues that are complementary and contrasting colors.